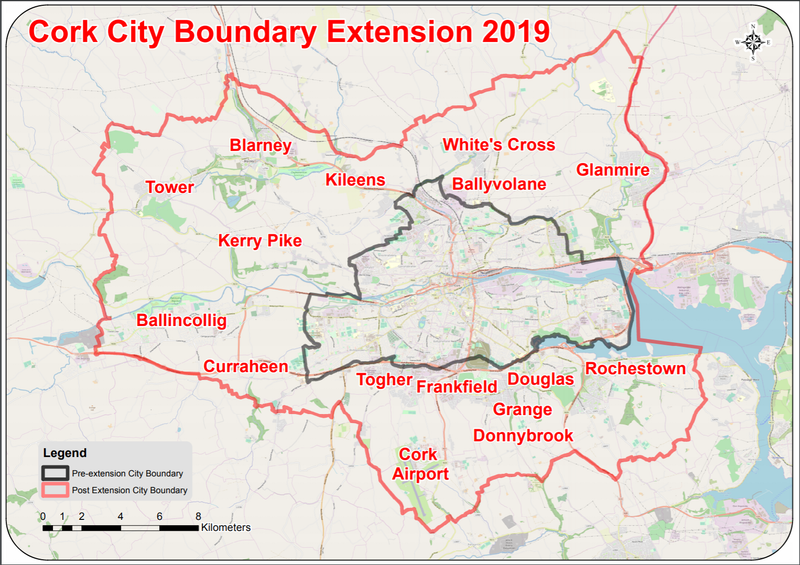 On the 1st of June Cork City’s boundary will change and the official city area will become almost five times larger, it will encompass Ballincollig, Blarney, Douglas, Glanmire and Rochestown. Its population will increase by 85,000 people. To put that in perspective, it’s 4,796 more people than the population of Ireland’s two largest towns, Drogheda (Census ’16 population was 40,956) and Swords (Census ’16 population was 39,248) combined. The council has launched an interactive web-map to show the new boundary that will come into force. It can be found here. The council have also produced a PDF of the new boundary which is shown below and the original can be accessed here.